Book Review: The One – It's Lily O. My first exposure to Danielle Allen’s writing was in her book released late last year, Work Song .It was a fantastic read (brought to my attention by book blog Girl, Have You Read? that put Allen on my radar. When she announced earlier this year that she had a book coming out soon, I quickly placed it on my To-Read List. 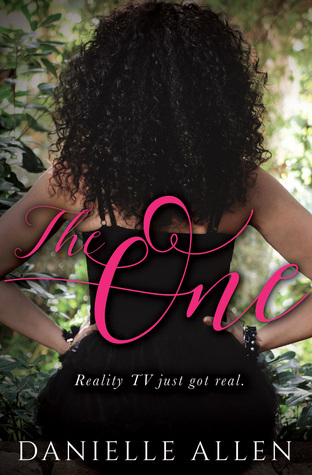 When her newest book, The One , became available I happily purchased and read it. Zoe Jordan – Is a proud feminist and lawyer, well lawyer-to-be, who wants nothing to do with reality T.V. Zoe is confident, funny and was an interesting character to follow in the story. Julian Winters*- Julian is a Music Producer and Songwriter who is the leading man on The One. While I didn’t find him swoon-worthy, I could see why Zoe did. *Julian is a love interest, Zoe is the clear main character and the story is told from her point of view only. The supporting characters in The One were over-the-top, funny and made me think about regular people who decide to join the casts of reality T.V. shows. They added a wealth of humor to the storyline, however, as a reader I would have liked to know more about the production staff. The storyline was great and, at times, felt as though I was reading a reality show which I thoroughly enjoyed. However, near the middle, the storyline became repetitive causing me to skip three chapters and read until the end. Afterwards, I came back and reread the ones that I missed. The shenanigans that occurred on the dates between were repetitive but I imagine that is how reality dating shows. I, like Zoe Jordan, am not a fan of dating reality T.V shows. They bore me to tears and I find them insulting. However, Danielle Allen’s The One made the concept very entertaining. If you enjoy reading books that will have you shouting things at your kindle such as “WORK IT ZOE!” or “COME THROUGH JULIAN!”, I highly recommend reading The One . Has Social Media Ruined April Fools’?